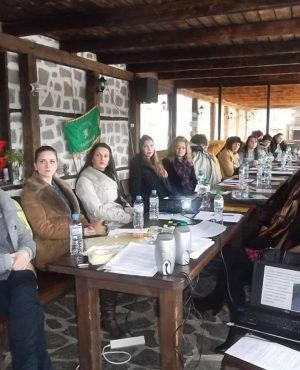 30 women from three pilot counties – Kalofer, Gorni Domlyan, Kurtovo, took part in a training on awareness raising for women in smaller towns towards human rights, gender equality and zero tolerance towards domestic violence. The training is part of a project by the “Young, active, creative” organization, which was financed by the BFQ. In the first phase of the project, a survey was conducted in several towns and villages in the Municipality of Karlovo. The data analysis revealed that nearly 80% of participants know women who have been victims of physical and mental abuse, but do not know how they could help them, whereas 20% stated that they have been subjest to domestic violence themselves. As in the Municipality of Karlovo there are no active specialized centers nor specialists to provide help or consultations to victims of domestic violence, many women do not dare to take any actions to protect themselves and choose to keep the problem behind the walls of the family home. The “shame from others” and “for the children’s sake” are further reasons for victims to settle for their “destiny” and are trapped in the vicious circle of violence without seeking help. This turns a personal, domestic problem into a social one. The next phase will be dedicated to the creation of mutual aid groups in the three counties, which will aim to introduce more women to their rights and raise their awareness and intolerance to domestic violence.